My favorite rom coms have a strong leading lady, plenty of smart banter and a dose of glamour. Of course, I want the glam to include jewelry. It can be over the top jewelry humor like Marilyn Monroe’s passion for diamonds in Gentlemen Prefer Blondes or the signature pieces from Tiffany and Hermès Reese Whiterspoon wears in Legally Blonde or even the tiny little jewels Emma Stone sparkles in as she sings her way through La La Land. Seven of my favorite rom coms, listed below, illustrate exactly what I mean. They twinkle and shine with jewels to get you in the mood for Valentine’s Day or just put you in a good mood any old day. 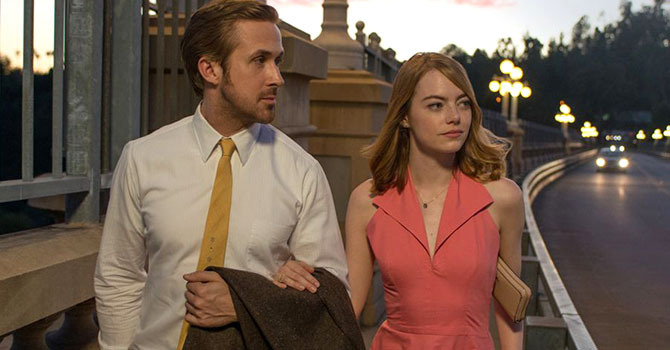 La La Land was inspired by old Hollywood movies. The innocence of Emma Stone’s character, a struggling actress, is reflected in her charming style. The jewelry worn through most of the film, from Kyle Chan Design in Los Angeles, is budget conscious. One simple necklace Emma wears is a $55 moss agate pendant. Find out about other pieces in the film in my full review here. In her signature role of Elle Woods, Reese Witherspoon tries to win back her boyfriend by following him into law school at Harvard. When she finds out her ex has given his fiancée a doorknocker sized diamond she cries to her manicurist, “She has the 6-carat Harry Winston on her boney, unpolished finger.” Next she turns her life around completely and does so in style wearing signature pieces from Tiffany and Hermès. Read my full review here. 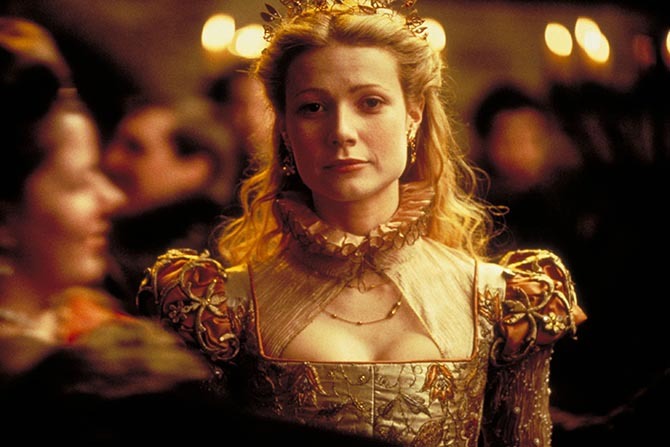 Gwyneth Paltrow wore her jewelry so well—best actress Oscar-winning well—in the few scenes of Shakespeare in Love where she is dressed as a woman and not as a man pretending to be a woman that the Elizabethan styles she flaunted became a trend when the movie was released. Little pearls, delicate gold and colorful rings were all the rage. It was no mean feat during the minimalist moment in fashion. Julia Roberts wears piles of jewelry when she meets Richard Gere in Pretty Woman but it really isn’t the point. The $250,000 necklace from the Beverly Hills jeweler Fred that Gere borrows for Roberts to wear to the opera provides the bit of now-famous jewelry slapstick. When she reaches out to touch it, Gere snaps the box quickly down lightly on her fingers and Roberts bursts into her famous laugh. Jewelry picture perfect, Tiffany sparkles like a diamond from the first scene of Breakfast at Tiffany’s (1961). 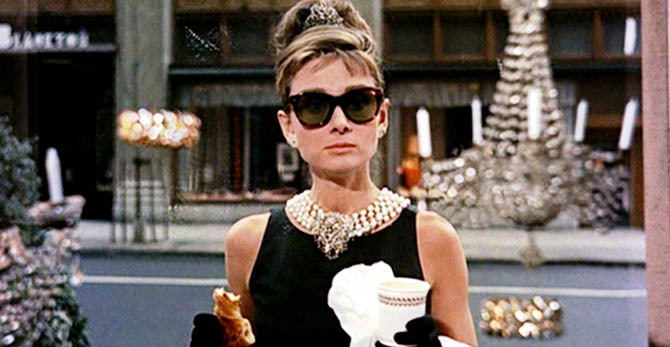 Audrey Hepburn may not wear one piece of Tiffany in the movie, but it doesn’t matter. The way she talks about the iconic jeweler is what leaves a lasting impression. Read my full review here. 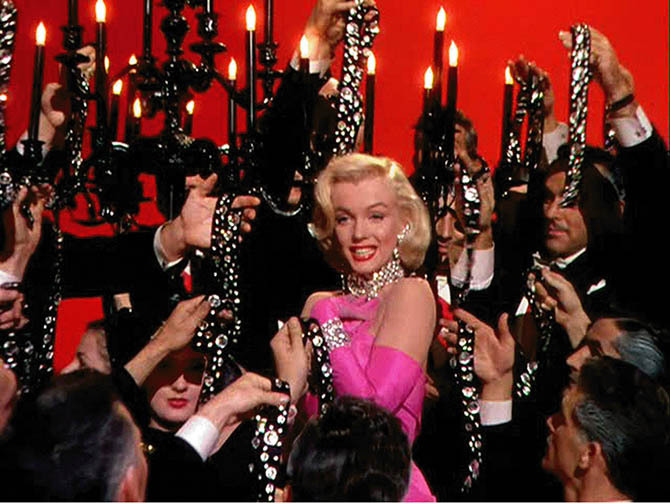 Marilyn Monroe’s performance of the jewelry anthem “Diamonds Are A Girl’s Best Friend” is the red-hot moment of this flawless comedic gem. If you haven’t seen Gentlemen Prefer Blondes trust me you will love the humor that goes on from start to finish. 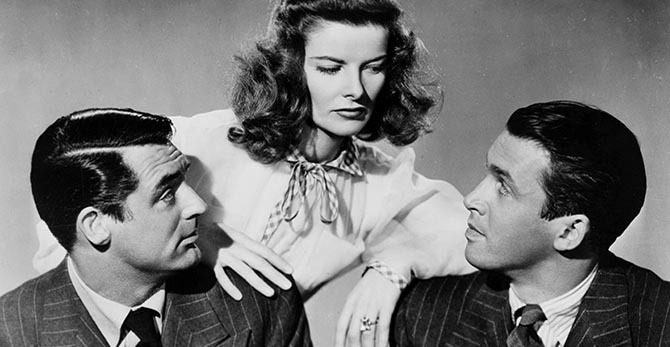 In a publicity still for ‘Philadelphia Story,’ Cary Grant and Jimmy Stewart pose with Katharine Hepburn who is wearing a Verdura engagement Ring. Katherine Hepburn has an impressive Verdura diamond engagement ring and a vulgar vintage jewel that’s a wedding present in The Philadelphia Story. The jewels become part of the hilarious banter in this classic screwball comedy. Read my full review of the movie here.